There are two ways to get to the Narrows of the Green River Gorge: by boat or boot. If you aren’t qualified to paddle class V white water, then lace up and hike the rugged topography of the Green River Game Lands in Henderson and Polk counties. The steep cliffs and mountainsides capture higher than average rain fall, and the shady ravines make a soggy sanctuary for ferns, lichens, and mosses that layer the landscape. The gorge is also a haven for amphibians, including the rare and locally endangered green salamander. 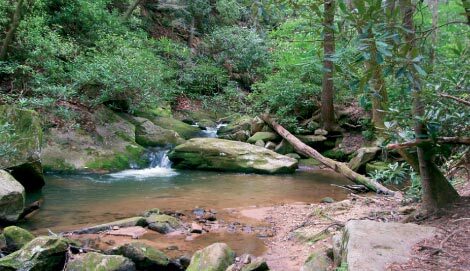 Take the Pulliam Creek Trail from Big Hungry Road and descend into a ravine below small crags. Midway down the trail, rock hop across the stream, and in roughly a quarter mile, a spur trail falls abruptly to the right. Here, you’ll glimpse the gushing river through a pinched slot of the gorge. This is the site of the Green River Narrows Race, one of the nation’s most extreme white-water competitions held each fall. Continue to the path’s terminus by veering right along Green River Cove Trail. Backtrack to the parking lot for a 6.5-mile round-trip. Navigate: To reach the Pulliam Creek trailhead from Saluda, take I-26 north to the Upward Road exit. Go right and in 1.5 miles, turn right on Big Hungry Road. After five miles, look for a small gravel parking lot on the right.